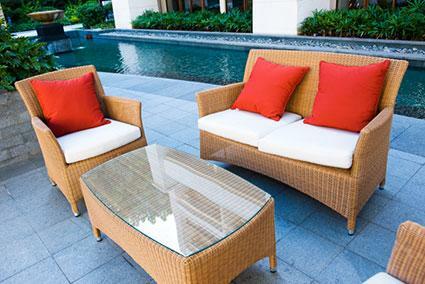 Popular trending patio furniture styles range from the latest hot products to traditional, regional, and retro designs. Before you set out shopping, decide what style is best suited for your lifestyle. Select a design theme that's an extension of the one inside your home to establish continuity in your outdoor living space. One of the hottest trends for patio furniture is to create intimate secluded or semi-enclosed spaces that create outdoor rooms. These rooms can follow themes and depending on budget and square footage, you can create as many unique spaces as you wish. Start with a simple patio setting for a conversation area, then branch out into an intimate space complete with a fire pit and chairs. Go big with a sectional that includes a chaise lounge or sofa set. Multi-functional furniture is the trend of wise shoppers. When it comes to creating outdoor spaces, the only limit is your imagination. Amazon is styling with the Baleares Bronze Modular Lounger. This is luxury in a grand way with a built-in adjustable overhead shade to block the sun and afford greater privacy. Configure the four-piece ensemble as a bed or settee with coffee table and two ottomans. Hayneedle is trending with the curve appeal of the Belham Living Meridian Collection. This all-weather wicker patio dining set mimics the banquette seating that's popular for interior dining and features ample cushions and pillows. Sears invites you to try a different lounging experience with the Grand Resort Smoky Hill set. This five-piece gas fire pit table and chairs highlights a 46" square table that provides a place for food and drinks while you enjoy the lava-rock fire basin. The table base camouflages the gas tank. The traditional patio look includes metal, wrought iron, wood and wicker. They create a classic design that appeals to many homeowners. Patios, verandas, porticos, porches and decks can all be transformed depending on the traditional style of furniture you choose. Fire House Casual Living is all about traditional with the Hanamint Grand Tuscany cast aluminum patio dining table and chairs set. You have many options with this collection, such as swivel rockers or dining chairs, along with various sizes and shapes of the table you choose. It's available in either a black or bronze finish. Summer Classics plays with flirting charm with the Croquet Teak Collection. Inspired by the French game of croquet that was so popular in the 19th century, it features marine-grade teak furniture with thick high-density cushions. It is available in several colors and fabrics. Wicker Central brings a nostalgic look to the patio with its seven-piece Classic Coastal Hampton Wicker Conversation Set. The all-weather wicker furniture is available in assorted colorful cushions, so it will match any color scheme you have in your outdoor landscaping. The various patio furniture styles that are region-specific can recreate a sense of ambiance for any patio design, whether you live in that region or just enjoy visiting. Choose the style that captures your fondest vacation memories to revisit each time you step out onto the patio. These popular choices will fit right into your vacation fantasy. 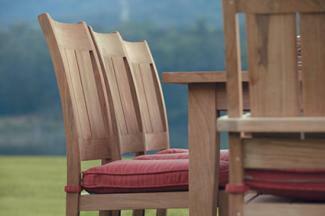 Lexington Home Brands knows that nothing says tropical the way Tommy Bahama outdoor furniture collection does. 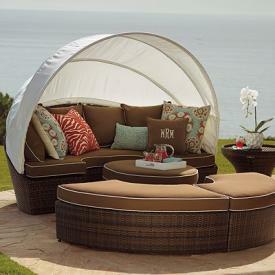 This classic tropical-styled furniture is offered in 175 all-weather performance fabric choices. Adirondack Chair Online sells the ultimate cedar made chairs that are also available in cost-effective finished kits ready for quick assembly. There are many polyresin versions also available at big box stores, such as Lowes. Ballard Designs features the classic beach style chair guaranteed to make any patio feel coastal. This folding chair has a solid teak frame with a Sunbrella Canopy Stripe sling seat with lumbar pillow. Four adjustable positions ensure you'll have lots of fun times lounging in these chairs. Retro patio furniture is never out-of-style and gives some great options for creating a specific look for your patio with a flair of nostalgia. 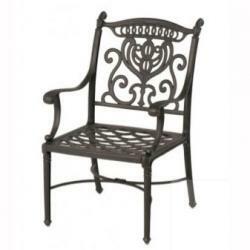 Metal furniture is easy to care for, another key point of its popularity, and pieces are comfortable patio choices. Hayneedle sells the Coral Coast Paradise Cove glider loveseat. It features your choice of white with cherry red or mint green finishes. The vintage looking glider has white cut outs in the center of the seat and back; seats are three feet wide. Grandinroad makes retro style the only way to enjoy a patio with its Retro Squares Collection. Sofa, loveseat, and chair gliders are available in retro colors. Complete the look with one of several fabric cushion styles. Don't forget to add a couple of retro metal side tables to your grouping. Retro Metal Chairs features the popular 1950s metal lawn chairs, motel chairs, shellback, bouncers, clamshell, and tulip chairs. They are available in fun bright retro colors. The easiest way to decide which popular style is best for your patio is to consider your overall taste and style. Look around the inside of your home and then step out onto your patio. Do you prefer the revitalized retro style or is the enduring popularity of old world Tuscan more in keeping with your décor preferences? Whatever you decide, be sure you go for furniture that is both comfortable and inviting.